This course was first conceived and designed more than 20 years ago in India by fellow physiotherapist and YogaSynergy Co-director Bianca Machliss and myself and has been revised, updated and improved every year till now. Unlike many courses on the anatomy and physiology of yoga we do not only teach you where your muscles and bones are, we also tell you what you do them while doing postures, movements and breathing. Bianca and I have together spent more than 60 combined years practicing yoga, 50 combined years teaching yoga and more than 60 combined years studying and teaching human biology and exercise-based physiotherapy. We have drawn from all of these resources to make our comprehensive online course. This course can give you the key to a safe and effective yoga practice, much better yoga teaching (even if you only teach yourself) and give you a lot of understanding about yoga therapy. 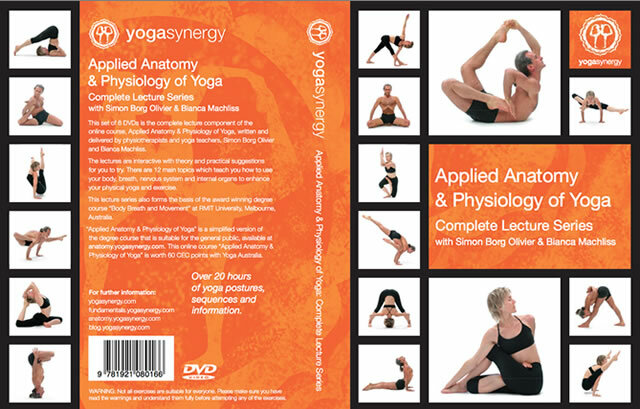 The ‘Applied Anatomy and Physiology of Yoga’ online course is divided into 12 main topics, which are ideally completed one a week for 12 weeks. Every week you will receive at least 2 emails with specific instructions on how to proceed in the course during that week and feedback on the previous weeks material. In every topic you will be directed to a streaming video lecture in which a specific aspect of yoga is taught in detail, a PowerPoint presentation and reading material from the new edition of our textbook ‘Applied Anatomy and Physiology of Yoga’ .